In this section, Aaron goes over his photo and plans out the entire retouch. Learn how to composite and add additional particles using custom made particle brushes. Aaron begins compositing stars behind his subject, blending him into the background seamlessly. In this section, Aaron composites more stars and begins doing color and effect work, using Hue Adjustment Layers and Layer Masks. 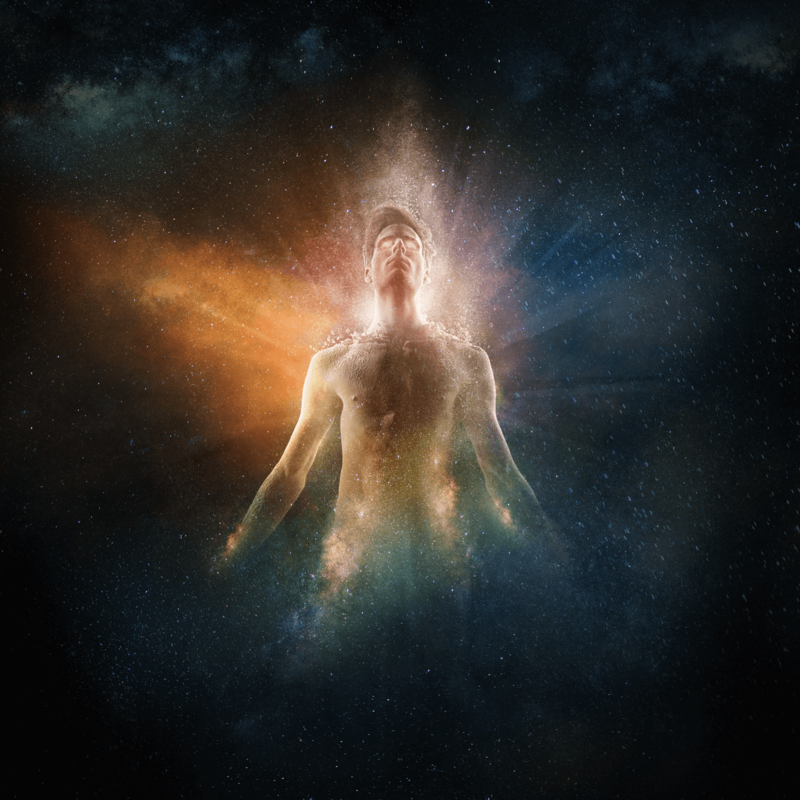 In the final section of this tutorial, Aaron completes the image with additional effects work. Aaron opens up the images that we'll be using for the composite and sketches out a plan to bring them all together. Learn how to replace elements in a background using other images. Simplify the background by removing large objects and distractions. Aaron creates a realistic hole in the ceiling that our subject will be suspended from. It's time to bring in our subject. Learn how to make a detailed cutout and then realistically place a person into a new environment. We continue working on our subject by compositing in more of her hair and other variations of her body in different poses. Now that all of our elements are in place, it's time to do some retouching on our subject to remove minor blemishes and distractions and then tie the composite together with some color grading. Aaron sketches out our plan for making this fiery composite image. Learn how to clean up a background by removing a window and extending a brick wall. Then we remove some minor blemishes and distractions from the subject. 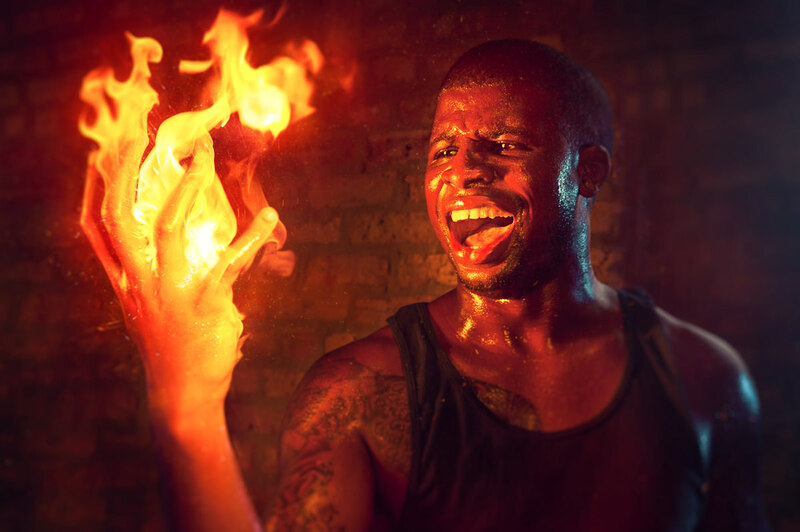 Using images of fire, Aaron composites and creates a realistic fire effect in Photoshop. With the main visual effects in place, learn how to finish an image with additional lighting and adjustments to help blend everything together. 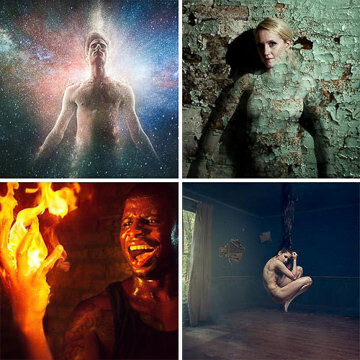 This tutorial is a bundle of some of our favorite Compositing tutorials here at PHLEARN. Learn to composite multiple images together so you can take the best parts of different photos and combine them, saving time on the photo shoot and giving you more creative options. In this tutorial, we cover some of the best practices for evaluating any composite. Follow along as we explain the correct tools and techniques to cut out the subject for this image. Learn how to use the Pen Tool to create paths and turn the paths into selections. Create incredible selections and speed up your background cleanup. Learn how extend and enhance your subject’s hair. Use Photoshop to combine many different layers of hair and learn how to mask, color, create highlights and blend the hair perfectly. 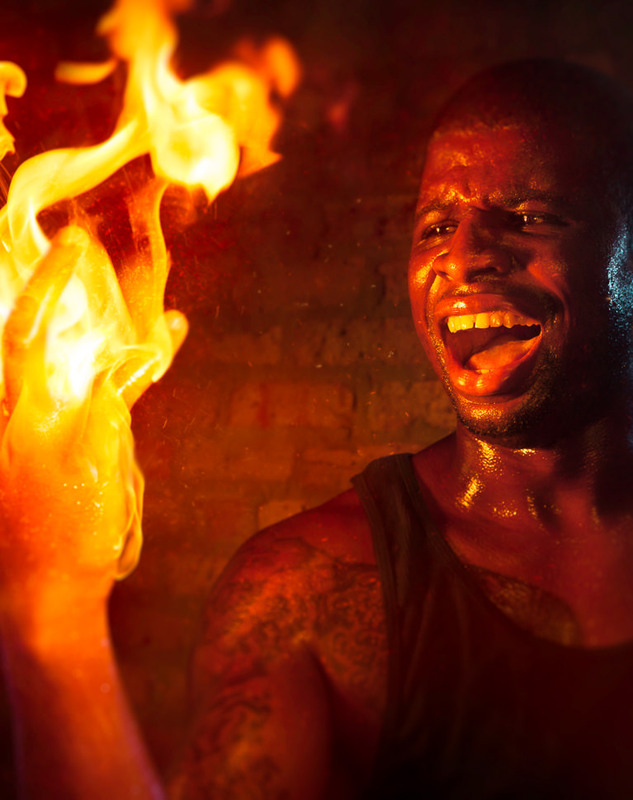 Learn how to add fire to a photo and make it look realistic. 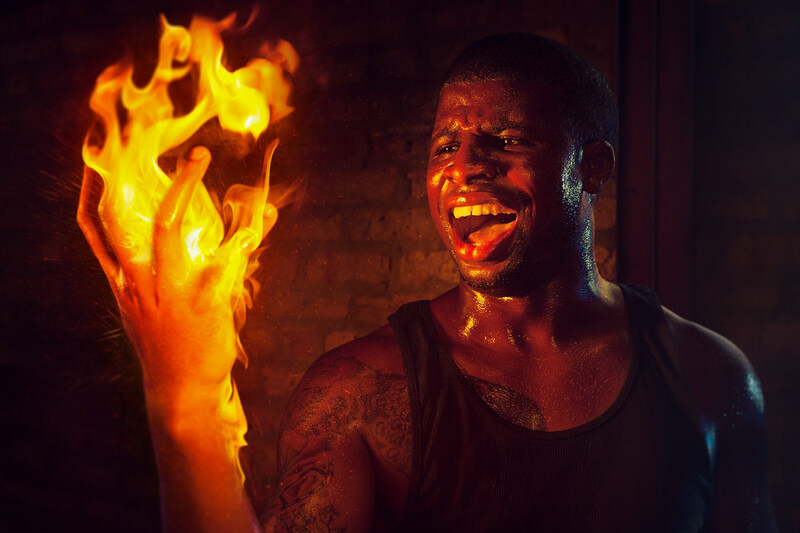 There are a few rules that you have to follow in order to make the fire look real, in this tutorial we teach you exactly how to make it happen. Oops! We couldn't find any recommendations for you. There’s a lot I love about the image of the woman suspended by her hair but I am bothered by the light on her coming from a direction other than the bright window. There is a distinct shadow on her back toward the window and the highlights on her hair are opposite the sun. I loved this tutorial. I will be coming back for more. I bought several of these tutorials individually and they were very useful to me. I would recommend them (and just about any Phlearn tutorial) to anyone looking to understand more about a particular subject. The way they are taught, it is very easy to learn and then apply to any other photos you are working on. 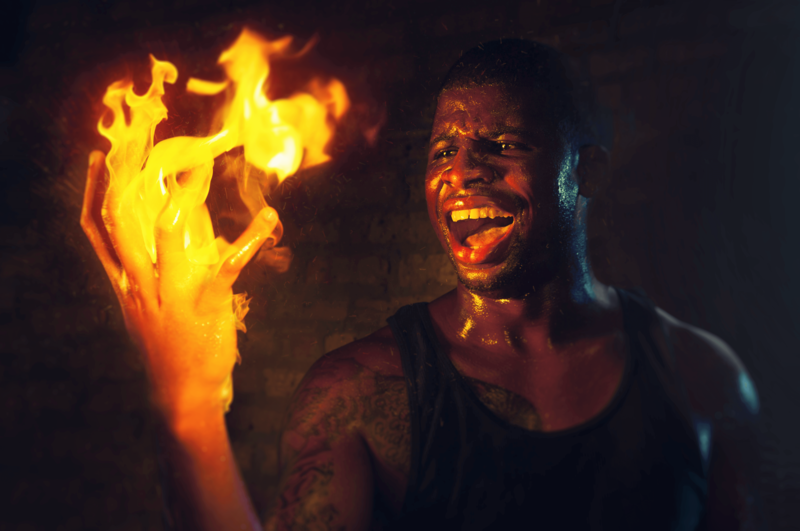 Here is an image I created after completing “The Human Torch” tutorial. (I am a complete noob at compositing, so I know this isn’t perfect (far from it) but it is a far sight better than it would have been without this tutorial. Hi, should be great if in the Pro Tutorials you include the photo shoot. It is a very important part and it is not included in the tutorial, and in some cases there is not “Behind the Scenes”. Thanks! Phlearn you later! What is included in this tutorial? This tutorial includes 15+ sample images and 5+ video tutorials. Can I download this tutorial? Yes! PRO Tutorials can be downloaded after individual purchase. All of our PRO tutorials are available for purchase in our Tutorial Shop. Not only do PRO Subscribers get unlimited access to stream our entire library of tutorials, they also receive exclusive discounts when purchasing individual course downloads. Downloads are not included in PRO Subscriptions. PHLEARN PRO Subscribers can stream every tutorial on staging-phlearn.kinsta.com. Video downloads are available only after purchasing a tutorial individually. Any tutorial may be purchased in the Tutorial Shop. We suggest using the latest version of Photoshop, but our tutorials are designed to be compatible with CS4, CS5, CS6 & Photoshop CC. Can I view my purchased tutorials online as well? Do I need Photoshop experience? We start from the very beginning and cover all the tools and techniques you need. If you are new to Photoshop, we recommend watching the Photoshop Basics Collection and Photoshop 101-301 to familiarize yourself with all of the tools and capabilities that the software has to offer.